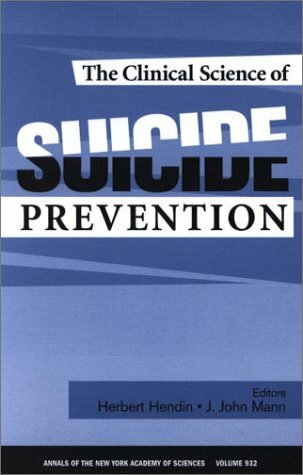 The Clinical Science of Suicide Prevention was the result of a conference entitled Suicide Prevention 2000 that was held on May 7-8, 2000 in New York City. Reading this compendium of fourteen chapters written by the presenters at that conference leaves this reviewer with the desire to attend the next conference that is held by the American Foundation for Suicide Prevention, as this work is a "must-read" for all mental health professionals. Suicide and suicide attempts represent a major cause of mortality and morbidity that disproportionably affect several segments of American society: persons with serious and persistent mental illness such as Schizophrenia, Mood and Depressive disorders and Borderline Personality Disorder; the elderly and youths and adolescents. Part I is comprised of six papers that address the Diagnostic and Clinical Considerations that clinicians need to consider, presenting a wealth of information and food for thought. The assessment of the depressed suicidal patient addresses the risk factors that increase the individual's proclivity for self harm. Interestingly, the treatment regimes of Lithium for persons with Bipolar Disorder and Clozaril for Schizophrenia result in a lower than expected risk of suicide, perhaps as the authors conclude, that the medication monitoring of patients using these medications provides increased clinical attention and earlier interventions in addition to the drug benefits. The treatment of substance abusing individuals as a high-risk group for suicidality, given the common comorbidity of mood disorders, psychoses, personality and anxiety is another noteworthy chapter that includes a description of several studies that appear to have promising results in the treatment of these patients. The roles of psychotherapy and pharmacotherapy with substance abusers point out the need for clinicians to adopt and integrate a number of strategies for treatment to be successful. Borderline Personality Disorders and the increased risk of self-mutilation inherent with this population calls not only for an understanding that their risk of suicide that is 400 percent that of the general population and 800 times that of females in general; but a greater examination of the mechanisms that underlie the biological basis of self-mutilation. For these individuals, Dialectic Behavior Therapy displays a promising treatment option that deserves further consideration. A very important contribution to understanding suicide risk pertains to the contribution that anxiety and impulsivity make to the process of moving from ideation to action among persons at risk for suicide; and, the need to address these factors as treatment conditions that can have an effect upon suicidal behaviors. Part II presents two seminal papers regarding two age groups at opposite ends of the spectrum who are most at risk for suicide: the elderly and youths. Following a review of the success and failures of a number of treatment modalities among youthful patients, the recommendation is made that a combined approach that involves the treatment of the psychopathology; cognitive distortions and difficulties with social skills, problem solving and affect regulation; with family education and intervention appears to have the greatest therapeutic impact. Seventy percent of elderly persons who commit suicide have seen their primary care physician in the month prior to their demise. Physicians and other professionals who can learn and recognize the depressive illness that may be present among their elderly patients may have a unique opportunity to prevent suicides among this population. The problems of living alone, recent losses both physical and social, restricted openness to new experiences, physical illness and the changes associated with reduced participation in familiar activities represent high risk factors that, if addressed, may reduce the loss of these members of society. Although Part III is specifically targeted for psychodynamically-oriented providers who may find themselves dealing with individuals at-risk for suicide, the lessons learned may be of use to all providers of mental health services regardless of orientation. As a cognitive-behaviorist, this Part offered a great deal of information that may be included as part of a thorough checklist of therapist cognitions when assessing the thinking patterns associated with the persons we treat. The first of the two papers presented addresses the factors of the psychodynamic paradigm that interferes with the ability to diagnose and treat suicidally-depressed individuals, concluding "the dynamically-oriented physician must use the dynamic model of the mind when appropriate and recognize that in certain situations it is not germane." The adoption of non-dynamic models in their treatment may uniquely enhance the psychodynamic clinician to develop an effective treatment plan for this group of persons in treatment with them. The second paper provides assistance by describing a number of ways that the psychodynamic therapist may adapt their treatment to more effectively deal with the psychopathology of suicidal patients, particularly those who present with narcissistic character disorders. Overall, the major cautionary note is that treatment providers need to be aware that patients may deny, with therapist's permission due to their own aversion of self-inflicted harm, that they are actively suicidal so as to avoid interventions that will deny their desire for self-termination. Recognition of suicide crisis and the timing of hospitalization of suicidal patients constitute Part IV. Suicide crisis, defined as a time-limited period of immediate danger of self-harm is distinguished from suicidal risk, defined as the probability that the person may, at a given point in the future, make an attempt on their life. Three factors are identified in the first paper in this part as markers of suicidal crisis: a precipitating event; one or more affective states other than depression; and at least one of three behavioral patterns: speech or actions suggesting suicide, deterioration in social or occupational functioning; and, increased substance abuse. The second paper of this section addresses the critical decision of determining whether a patient needs immediate hospitalized, bearing in mind not only the general risk factors in their background, such as older white males residing alone, prior suicide attempts, substance abuse and a family history of suicide attempts/successes, but present indicators such as command hallucinations, medical conditions, anxiety, aggression and personality disorders (Borderline and Antisocial). The author cogently warns that trusting persons in suicidal crisis to self-transport or family members who may be manipulated into diversions is a menu for disaster. The final section, Part V, presents two papers regarding the effects of the media following a suicidal incident and the contribution of firearms to suicide risk. The presence of a gun in the home, particularly among youthful individuals with a high level of impulsivity based upon their lack of cognitive development, is one of the strongest predictors of suicide, regardless of psychological disorders that may, and in many instances in the general population, may not be a subject of treatment. Finally, the effects of media coverage of successful suicides and attempts for the past two decades in the United States and other countries has indicated a strong correlation between prominent, frequent and sensational coverage and increases in suicidal behaviors, particularly among youth. Most promising is the adoption of media guidelines by Austria, written by mental health professionals, that has been shown to have a significant impact upon reducing suicides in that country. Following each of the articles is a discussion between the presenters and the moderators of the conference. These discussions further clarify and expand upon the information presented within that chapter, leading to further contemplation regarding the subject matter. This reviewer suggests that providers, researchers, and administrators of mental health and criminal justice programs that find themselves involved with the nationwide transinstitutionalization of persons with severe and persistent mental illness due to the closure of state-operated psychiatric facilities interested in further information contact the American Foundation for Suicide Prevention at www.afsp.org, not only to remain current but to enhance their proactive responses to suicide. Lou Gallagher, Ph.D. Education: B.A. in Psychology from Hofstra University, M.S. Ed. (with Distinction) in Vocational Rehabilitation Counseling from Hofstra University, M.A. in School-Community Psychology from Hofstra University, Ph.D. in Clinical and School-Community Psychology from Hofstra University. Dr. Gallagher is a Fellow of the American College of Forensic Examiners. He is a NYS Certified School Psychologist and Licensed Psychologist, with training at the Institute for Rational Emotive Therapy in the early 1980's. He has taught Psychology at Hofstra University, Long Island University and other institutions in the past. He has served for nineteen years as a Supervising Psychologist with the Suffolk County Division of Community Mental Hygiene Services where he currently supervises a number of community-based programs to divert persons with serious and persistent mental illness (SPMI) from the criminal justice systems; provide services to SPMI individuals being released from and within correctional facilities; and, coordinates disaster mental health services and the Mental Health Response Team, in addition to serving as the inoculated mental health responder for the Suffolk County Smallpox Response Team. He has been in private practice as a consulting and clinical Psychologist for twenty-one years, with an emphasis upon anxiety disorders, depressive disorders, developmental disabilities and Aspergers Syndrome and forensic issues.